Devilry and mischief pervades a cold winter holiday night in Nikolai Gogol’s magical ode called The Night Before Christmas. A dark entity absconds with the moon hidden in his pocket. Thereafter, he roams around tormenting people as he pleases. Sisters Valentina and Zinaida Brumberg animation from 1951, with English subtitles. In Gogol’s story, Vakula, the blacksmith, is the son of the witch Solokha (pictured above). More than anything he wishes to win over the affections of Oksana, the beautiful daughter of a Cossack named Choub. STORY: Dmitri Shostakovich: Revolutionary Composer or Soviet Propagandist? 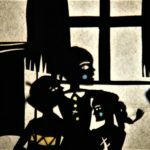 Noch pered Rozhdestvom (The Night Before Christmas) Created in 1913, this is a rare live action production from the legendary pioneer of stop motion animation, Ladislas Starevitch. Based on the short story by Nikolai Gogol. The Witch Solokha, Stage Design for Gogol’s play Christmas Eve, 2004 (gouache on paper) by Alimov, Sergey Alexandrovich (b.1938); State Museum and Exhibition Centre ROSIZO, Moscow. Nikolai Vasilievich Gogol (1809-1852) was a Ukrainian-born Russian dramatist, novelist and short story writer. That would be a true Nightmare, Taylor!